I’ve looked at a few kids, like at the store, and one thing I’ve noticed is that they sleep a LOT. Why is that? And while we’re at it, why is it that I spent an entire controller-crushing hour trying to figure out that one level in the puzzle game Braid before giving up and then nailing it on the first try after a good night’s sleep? Actually, both these questions have a related answer. Sleep, it turns out, is integral to learning. Some psychologists and neurologists believe that sleepy time –especially deep REM sleep– is the time when your brain releases key chemicals to throw up the “under construction” signs and rearrange your neural connections based on what you’ve been exposed to. 1 This is one possible reason why babies sleep so much: they literally have to shut down to assimilate what they’ve taken in. 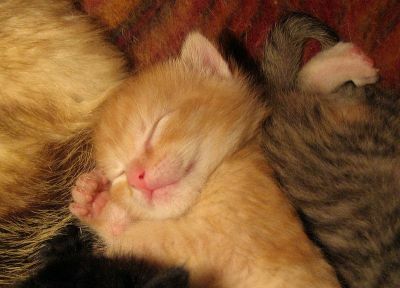 I used this picture of a sleeping kitty because it was in the public domain. Also, he's so cute! And in addition to generally refreshing you and resharpening your reflexes, sleep seems to have a similar effect on learning tasks that involve precise, manual finger movements. In one study of this phenomenon 2 researchers had subjects complete an exercise where they tapped buttons based on what they saw on a computer screen, and if that’s not a dead on description of a video game I’m not sure what is. There was an underlying pattern to the stimulus, and subjects were either told to try and uncover the pattern or they were left to their own insights. When the subjects were invited back to repeat the task, the researchers found that those who had gotten a full night of rest saw dramatic improvements in their performance while those who had just taken a 15 minute break saw no such increase. Other research 3 found that a full night of sleep yields a 20% improvement in similar tasks. But that’s not where the benefits of sleep on task performance end. Other research has shown that sleep also increases creativity and problem solving. So the next time you’re enraged your inability to time a series of jumps or figure out how to make a mustache out of a piece of tape and a cat 4, try sleeping on it. Let your brain take what it’s gotten and make some sense out of it without your standing there over its shoulder and making demands. 1. Maquet, P. (2001). The role of sleep in learning and memory. a one-year delay. Science 294, 1048–1052. 2. Robertson, E.M., Pascual-Leone, A. and Press, D.Z. (2004). Awareness modifies the skill-learning benefits of sleep. Current Biology 14, 208-212. 3. Walker, M.P., Brakefield, T., Morgan, A., Hobson, J.A., and Stickgold, R. (2002). Practice with sleep makes perfect: sleepdependent motor skill learning. Neuron 35, 205–211. The reference would be to Gabriel Knight, which was the feature of a hilarious article on the Old Man Murray site. Woo! Bonus points all around! Pingback: are all male cats prone to urinary problems? My problem with these studies comes from their samples. A night of sleep is not comparable to a 15 minute break, especially if the argument is that the sleep is enhancing the participant’s learning. The ideal control group would be people who do not experience REM sleep, such as people taking MAOIs (Manoamine oxidase inhibitors; which may abolish REM sleep in people taking them). Additionally people taking MAOIs do not cease to learn, and in fact, have been shown to learn at appreciable rates when compared to people who do experience REM sleep. I’m not saying that REM is not important, just that it might not be as important to learning as it has been construed to be. Whilst it is true (anecdotally) that sleep helps solve problems, taking a break can do the same. When I was doing a PhD in astrophysics, there are times I would get stuck on problems – no great surprise there. Continuing to work at it was generally pointless. I found that going for a walk in the park and not thinking about it, or going to pester a friend, or any number of other things that were emphatically ‘not work’ was helpful. Very often, when I came back to my desk and looked at the problem again, the answer would come to me instantly. I describe it as my subconcious continuing to work on the problem while I am conciously doing something else, so when I next come back to it the answer it there. (That’s probably the kind of hand-waving description that makes proper psychologists and cognitive scientists despair). Many other friends had similar experiences. One additional factor is that simply having a chnage of scenery helps; I personally find I can get stuck in patterns of though. Bizarrely, whenever I walked into a squash court, I would think of a certain friend who had absolutely no connection with playing squash in my mind beyond the fact that she popped into my head whenever I walked into a squash court. There seems to be some way in which visual input can lock my mind into certain lines of though. So when I get stuck, radically shifting my visual situation (particularly from artifical office to e.g. a forest) also kicks my brain into new lines of thinking, which helps solve problems. Going back to the study, it would be interesting to see how ‘offline learning’ performance varies as a function of time away from the game, and change in location (say 15, 30, 45, 60 minute breaks in the same room vs in a park reading a book – although obviously the times used would depend on some trial and error to determine the useful timescales inolved). A lot of people know that the brain works by sending an electrical impulse down a neuron and then a chemical signal (neurotransmitter)is released to the secondary neuron which has receptors. The neurotransmitters bind with the receptors on the second neuron and cause and electrical impulse to travel down the second neuron repeating the process. Researchers have also discovered a secondary process where after the first neuron releases the neurotransmitters, an electrical signal is sent BACK up the neuron strengthening it and making it so next time there will need to be less “primer” for the neuron to fire. This is a positive feedback loop. The more a neuron fires the more it is strengthened and the more easily it will fire the next time. The more you think about something the stronger the connections in a chain of neurons become. This can lead to one track thinking as more and more the chain just leads down the same path. This is why free thinking and thinking outside the box are so valued. It is tough to reform our thoughts and re train our brains after continuous positive feedback. Depression utilizes this by creating a downward spiral of depressive thinking, over-time the brain just wires itself so those thoughts are the most common. This is a long term effect but I think similar events take place over the short-term as well. You keep trying to solve a puzzle and end up repeating the same ideas and are unable to “break” free from the box. Your brain is just following the same neuronal chains to reach the same conclusions. Taking a break will give these neurons a chance to relax and you come back 20 minutes later and the solution seems so obvious. If the participants were learning a task and then allowed to take a 15-20 minute nap how would that compare to those that just relaxed or did a calming activity? This is something that I’ve noticed in my own life while learning to play the guitar and the piano. If there is a difficult part in a song that I just can’t seem to get right, I try it over and over and over again until my fingers hurt and my mind is numb, and then I sleep on it, and lo and behold, it has become easy as pie. This is very true. When I used to competitively play World of Warcraft, I remember our weekly raids would start at 7 pm Eastern time. We were fairly successful overall, but by 9 pm, fatigue would start kicking in, and anything past 10 pm would be a chore, a sluggish shuffle through the muddy depths that is end-game raiding in WoW. When TBC was about to come out, we gave up raiding a month prior to launch, and just went all out in Arathi Basin PvP. The hours for PvP changed from weeknights to midday on weekends, and there was a marked improvement in not only the morale but the stamina for the number of hours we could play. I remember one streak of 27 consecutive wins (several 5-caps) in Arathi Basin, over the course of 6 hours. The bottomline is, I can say from personal experience that sleep makes all the difference in a raid, just as well as any other RL factor. This is why ‘work’ normally starts early in the morning, when you have had sleep and your mind is fresh from the get go. Pingback: Se7en Tidbits: “Raid Leader’s Resume” or “St. George is Overrated!” « Are We New At This? I would agree that more groups would be needed to rule out whether the amount of time between play sessions is more of a factor than sleep. However, there is other evidence out there that sleep plays a huge role in the consolidation of memory (this is why cramming all night for a test is a super-bad idea). I am only assuming, but I imagine this goes for procedural motor memory as well. Also, a relaxation activity or alternative activity may not be as beneficial as would be sleep. Only during sleep can we so effectively shut down those pesky logic-constrained frontal lobes and allow the limbic system to thrive. This allows room for the proliferation of “outside the box” ideas. From personal experience, I have definitely found that waking up the day after a frustrating videogame experience is usually followed by a first-try victory. Psychology is one of the most interesting branches of science because there are so many unknowns.::. Ha Ha Ha……very funny photo.